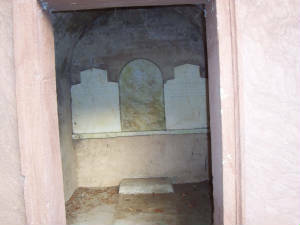 When They Were youngsters, Marion Whaley pushed his brother Maynard into the old marble mausoleum that stands in the burying ground at the rear of Edisto Presbyterian Church. 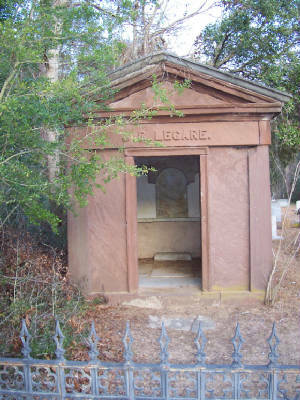 It was a scary thing to do, for in July 1850 a young girl who was visiting Edisto Island died with diphtheria and was buried in the mausoleum. Later on, it was learned that she had been buried alive. "It was me or him," Marion Whaley explained years later, "Maynard planned to push me into the mauso­leum where the girl had been buried alive, and he was going to prop up the marble door in the entrance opening so there could be no escape. I would have had to stay there overnight. When I learned of the prank he planned to play on me, I just beat him to it. I shoved him inside the vault and pushed the marble door into place, and the door remained shut until I came back the next morning and freed him." That part of Edisto Island is as gloomy today as it must have been in 1850. Huge oaks, with pendulous masses of Spanish moss looping from limb to limb hover over the land, and strange things happen there. Once a white stallion jumped high into the air and died when he was caught in the fork of an oak tree. The skeleton of the animal remained in the tree long after every bit of the flesh had been consumed by birds and animals, and for years people came to view the horse bones in the old oak tree. 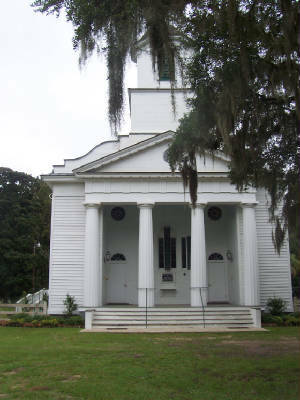 The Edisto Presbyterian Church was designed by James Curtis, a Charleston architect, and was built in the early 1830s. It looks today much as it did then. A weathervane adorns the steeple. Interior walls are of heart pine paneling. The pews have entrance gates, some of them retaining the original hinges. Those who look up can see the wood benches once used by slaves. Generation after generation of Edisto Islanders have knelt in worship at the rail that encloses the chancel of the white clapboard church. The graveyard that surrounds the church on three sides dates back to the eighteenth century, and the names on the grave markers are evidence of prominent South Carolina families who have been buried there, many having died of diphtheria. The names include Edings, Mikell, Seabrook, LaRoche, Hopkinson, and Whaley. Diphtheria was a common disease in the South Carolina Low Country during the 1800s. The first effective diphtheria antitoxin was not developed until 1890. This contagious disease spread throughout the barrier islands of South Carolina in 1850, and when the telltale yellowish-gray patch appeared on the throat of the young girl who was buried alive, it wasn't long before she went into a coma so deep that word mistakenly came from the physician that she had died. As there was no artificial preservation of dead bodies on Edisto Island before the Civil War, it was the practice to bury the dead as soon as possible after their demise. So word was sent to neighboring plantations that the girl's funeral would be held that very afternoon. As the people of Edisto Island prepared to attend the funeral and burial of the girl who had been visiting in the home of a planter family, loving hands prepared her body and dressed her in the pink dress that had been her favorite. After the funeral was held in the sanctuary the body was placed in a marble mausoleum behind the church, under a canopy of oaks and pines. The tomb door was a broad, flat, thick piece of marble, hinged on one side. It was closed and locked. In the amber glaze of the afternoon, the mourners left the cemetery, walking among the marble forms of cherubs, urns, and other symbols of eternal sleep among the trees. Just before leaving the burial ground, some turned for a last look at the mausoleum with the family name, J. B. Legare, carved above the door. The sepulcher lacked columns, hut it could have doubled for a tiny Greek temple. Some fifteen years later, one of the men of the Legare family was killed in an accident. His body was prepared for burial and taken to the church, where his funeral was held. When the heavy door to the family mausoleum was opened so that the remains of his body could be interred, there, to the horror of the members of the family, was the skeletal frame of the young girl who had been buried earlier. From the position of her remains, it was clear that she had been buried alive, and at the time of her death she had been trying to escape from the mausoleum. Members of the family felt the horror the young girl must have felt when she realized she was trapped, and they felt the panic that must have driven her to try without hope to escape. The man was entombed, were the skeletal remains of the young girl, and it was several weeks before any of the family returned to the mausoleum. When they did, they found the door to the vault standing open. The door was closed again and fas­tened in such a way that it seemed impossible that it could ever be opened again. However, strangely, in a few weeks an elder of the church discovered the door standing open again. 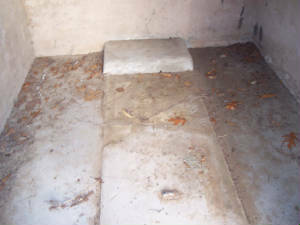 Word spread throughout the area that the spirit of the young girl who had been buried alive would not allow the door to remain closed so that no one else would be buried in the tomb alive. For more than a hundred years it was impossible to keep the door to the mausoleum closed. About thirty years ago the door was again attached in such a way that it was concluded it would be impossible for it to be opened except with certain heavy equipment. But a few days later, the door was found not only open but removed from the mauso­leum at the hinges. The concerned administrators of the church then had the door reinstalled and fastened by a heavy iron chain. But within a few days the door was again lying on the ground in front of the mauso­leum! Today vines grow in the cracks of the marble mauso­leum, and spider webs and wasp nests festoon the doorframe. And the stubborn marble door lies broken into three pieces on the ground at the vault entrance. Note: The above story was written by, Nancy Rhyne. It was taken directly from the book, "More Tales Of The South Carolina Low Country". This fine book is available in a number of stores located on Edisto Island.